There are all too many reasons why you’re looking for a good dog crate. Maybe Fluffy isn’t so cute after he’s eaten your couch while you ran to the store. Or he could be feeling anxious or overstimulated and just needs a place to cool down. When you travel, whether it’s a camping trip or a flight overseas, it’s nice to bring your best friend along; and he appreciates getting out of the house just as much as you do! Owners of the Huskies and great Pyrenees’ of the world will understand the need to search out a dog cage in jumbo size. Whatever your canine’s breed, there’s a lot on the market when it comes to large pet crates, so we did the homework to seek out the best. You’ll want to know what dimensions you’re looking for though, so step one is to measure your pup. The FAQ section below explains in detail how to do this. It’s normal to feel wary about putting your pup in a cage, but a good kennel can act as a safe space for your canine friend. These second pet homes keep your dog sequestered and cater to their den instinct. Large breeds need larger, and usually more durable crates that are designed to keep them from breaking out. If you happen to have a particularly crafty escape artist on your hands, not to worry because we’ve got you covered. If you’re worried a crate won’t look very nice in your home, there’s an option for you. Or, if you’re on a budget, read on my friend. This crate reviews well with pet owners that can speak to the high quality of this folding metal dog crate. It’s sturdy, with thick metal wire bars, yet lightweight (less than 10 pounds). It’s easy to set up, and easy to break down and carry around as it folds flat and comes with a handle. Cleaning is a piece of cake because there’s a removable tray. On the bottom, it has rubber roller feet that prevent it from scratching the floor and makes it easy to move around. It comes in 6 sizes. You can choose to buy the single or double door model for convenient in and out access and more options for placement around your home. Safety features include two heavy-duty slide-bolt latches per door. The round corners will keep you and your pup safe from nicks. 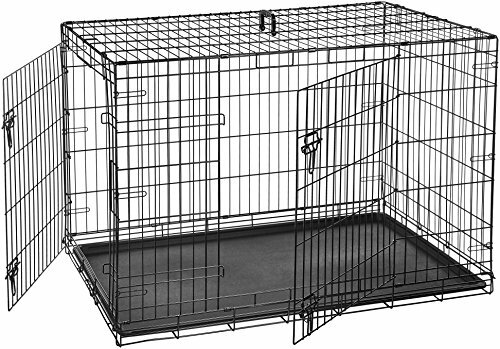 As your large canine breed continues to grow, this crate comes with a divider panel that expands its dimensions. There’s no need to keep upgrading. If you have any issues with it, the crate comes with a one year warranty to ensure you’re happy with your purchase. 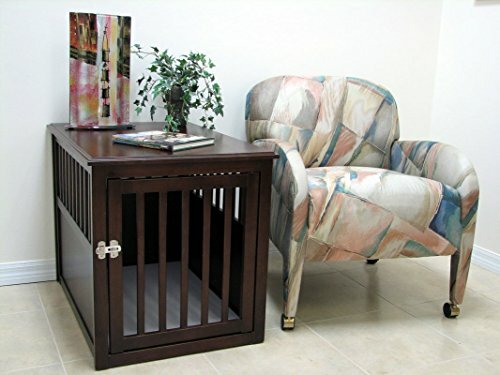 The Crown Pet Table is a luxury dog crate that doubles as furniture, so your crate doesn’t have to be a big eyesore in your home. As far as wooden dog crates go, this one is crafted with top-notch tough rubberwood. This is a hardwood often compared to teak that’s known for its density and tight grain. This means that it can endure wear and tear. You can choose from 2 sizes, medium or large. There are 2 colors to match your decor – espresso or mahogany. The stained and lacquered finish makes this crate table look extra sleek and stylish. Say there’s an accident, this crate won’t stain, as the floor is made with waterproof melamine MDF that absorbs liquids and odors. The door swings both ways to provide easy access that will stay out of you and your pup’s way. The space provides ventilation, with multiple vents for a 360-degree view. Unlike many double duty crate tables that don’t pass the test, this one ranks high with real dog owners. Though it’s not within everyone’s budget, this is a great choice if you’re looking for a kennel with a combination of style and functionality. For an added bonus, the rubberwood is ecologically sustainable. Considering the durability and amount of features you get with this crate, the price of the AmazonBasics Folding Metal Crate is unbeatable. It has a steel wire frame, with two slide-bolt latches per door, and has mini dividers so a canine with smaller paws can’t sneak his paw through. There are both single and double door options and 6 different sizes. This collapsible crate comes with a handle for easy travel. For another layer of convenience, it comes with a removable tray in case of an accident. You can also expand the dimensions with the divider panel that’s included. This is a crate that won’t break the bank that you can feel safe putting your pooch in. 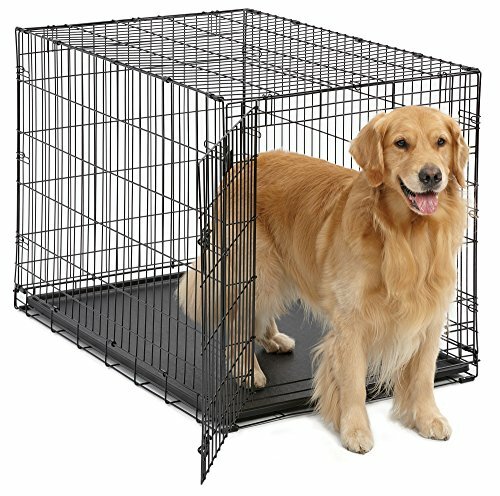 If you’ve tried everything, but your dog still somehow manages to escape his crate, this heavy duty crate is your new best friend. It’s called the “Alcatraz” of pet crates for a reason, with a 20-gauge steel frame that’s ¾” thick and reinforced by ½” diameter steel tubing. The heavy-duty stress point welding and double door stout latches make these crates virtually indestructible for even the strongest escape artist. It’s finished in a high-grade rust-resistant coating, which adds to its durability. The availability is in two sizes – medium and large, the large fitting most larger dogs. The floor is a steel grate with a removable tray below for easy cleanup. Wheels with locking casters make it easily mobile and set the crate above the floor, so it’s almost impossible for any accidental bathroom mess to reach your carpet. For adult dogs that are fully housebroken, you may want to buy a comfy mat or bedding for the bottom. It’s a pricey choice, but can save you hundreds of dollars in broken crates and destroyed valuables from a dog with separation anxiety. 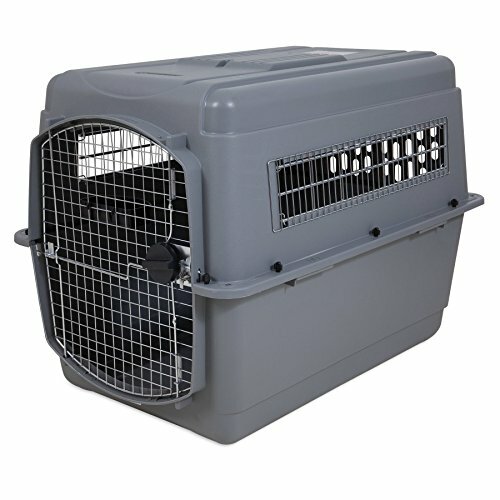 The Petmate Sky plastic dog kennel was designed with air travel in mind. Some might like to keep their furry friend in a soft crate for comfortable travel; airlines don’t allow the soft-sided collapsible dog crates. This crate is compatible with airline travel, not to mention super easy and quick to assemble. Each kennel comes with “Live Animal” labels, ID stickers, and a food and water cup. It’s made of high strength plastic, has durable wire interlocking doors, and a four-way latching system for your pet’s safety. It comes in 6 sizes, including “giant.” The Petmate crate has 360-degree ventilation and visibility, so your pet gets healthy air flow and stays comfortable during their travel experience. Though it meets most airline requirements, always make sure to check the specific airline before you travel. If you’re feeling lost in all the different kinds of dog crates out there, you’re in the right place. We’ve put together a list of who might want to buy a dog crate and why, things to look for in your crate, and answered frequently asked questions about the process of finding the right crate for your dog. There are many reasons pet people use dog crates. House training, security for nervous dogs, and keeping your house safe when you’re away are the main reasons many consider this option. Aren’t sure you need a large dog crate? Usually, a simple internet search of your dog’s specific breed can determine the predicted weight of an adult dog. Large dog breeds tend to fall in the 50 to 85-pound range. Smaller than 50 pounds is considered medium, and larger than 85 pounds is considered giant or extra large. Most crates will specify weight compatibility as well as height and length. If you work away from home or leave for an extended period of time, crates are a great way to keep your dog confined and out of trouble. Many dogs experience separation anxiety and can get destructive when left alone, so to avoid coming home to garbage can raids, chewed shoes, and a couch turned inside out, get your dog a secure crate and leave him with a good chew toy instead. Nervous dogs appreciate confined spaces that give them the cozy feeling their ancestors were used to from caves. Giving your pooch some alone time in a space that is all his can help soothe his anxiety when, say, you get the vacuum cleaner out. Visitors that are allergic, afraid, or unsteady around dogs will appreciate your dog being tucked away when they come over in their nice dress for that dinner party. This is especially true for protective dogs that, though they’re just trying to protect their family, might scare a little kid from liking dogs. If you have an overly-exuberant dog that likes to jump and give unwanted kisses to the wrong person, a crate is a good option while you have company over. Another scenario is if your friends want to bring their small dog over, but you’re worried about your large dog playing too rough. Dogs aren’t like rabbits– they typically don’t want to go to the bathroom where they sleep. This is another reason (besides that they like a confined space) not to get a crate that’s too large. Accordingly, this makes the crate a great tool for teaching proper protocols to do their business. It helps to make the crate a happy place by placing toys, blankets, and mats inside. If you’re busy and can’t watch for bathroom signals, the crate is a good place to keep your dog from going into your house. Talk to your dog trainer for more tips on housebreaking. When you’re shopping for a pet crate, there are specific factors you want to keep in mind. Of course, you know you want safety and security, but maybe you didn’t realize there were other features to be mindful of. We made sure to offer you safe and easy to use options in our review by looking for these key points in our research. The choices seem to be endless, so some of these features like sharp edges won’t apply to a soft crate, for example. This will be the first thing you look for when shopping for a crate. If you’re buying for a puppy, you can talk to your vet about how big your dog’s breed typically gets. For more anxious puppies, you’ll want to stick to a smaller size and upgrade later. Especially if you’re crate training a puppy or have a dog that likes to chew, avoid plastic or cloth crates as their full-time crate. If it’s not a heavy duty dog crate, your dog could completely destroy it. A metal dog crate is a good go-to for durability. Dog cages with lousy door latches make it easy for your dog to escape, so you want to look for a quality latch. 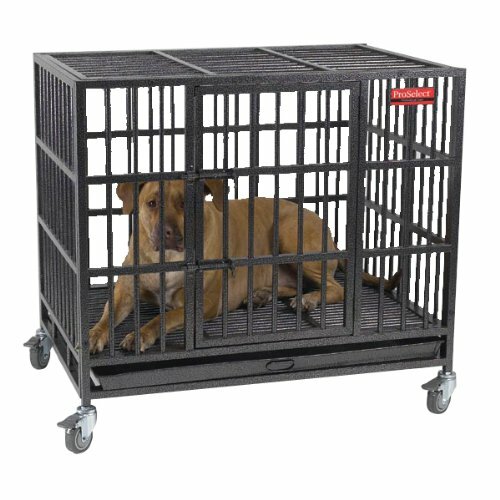 Crates with especially large latches are easier for your dogs to open themselves. If your pup is a pro escapee, you’ll most likely need a crate designed with a double latch or advanced locking mechanism. Low-quality crates can have sharp edges that are hazardous to your dog. You can smooth minor rough spots with some sandpaper or steel wool, but any significant rough edges should be avoided for your dog’s safety. If your dog has an accident, tips over a water bowl, or makes any kind of a mess, a removable tray makes it a whole lot easier for you to clean. For road trips and camping, look for cloth crates that collapse. This will save space in your car and still give your dog a familiar, cozy place to ease anxiety in new places. If you’re flying with your furry friend, check out airport and airline regulations. It’s smart to be overly cautious here and expect the strictest of regulations when picking an airport safe crate. You definitely don’t want to get held up for a non-compliant crate when you’re taking a plane. How do you determine the size of a dog crate? First, measure your dog from the tip of the nose to the base (not the tip) of the tail, then add 2-4 inches, and you have your crate length. Your dog should sit as you measure from the ground to the top of the head, add 2-4 inches, and you have your crate height. These two measurements will be your guide as you search for the best large dog crate. Don’t worry about crate width; crates are designed with the proper length-width ratios in mind. Most large to extra-large dogs need crates that measure from 40-60 inches in length. Some sources recommend adding 4-6 inches to the length of your dog. This is up to you if you’d like to give your dog a little extra room. However, any extra space over this amount takes away some of the benefits of a dog crate. How long is too long for a dog to be left in the crate? You shouldn’t leave your dog in the crate for more than 8 hours max, and these full days shouldn’t be all the time. Make sure you give your dog proper exercise before leaving him in the crate; between 30-60 minutes is best. It’s possible that your dog sees his crate as a safe space, and in this case, never close the door of the crate. This way, your pet will have the choice of whether to go in or not. Where should I place the dog crate? You don’t want your dog to feel isolated. They are social creatures and therefore want to be in the center of whatever’s going on. For daily use, put the crate someplace central where he can see you or someone in the house. This will make him feel like part of the pack. When you’re first crate training, you’ll want to put the crate in your bedroom at night. If your dog can see and smell you, it will help him calm down and fall asleep. If you don’t want him in the bedroom (maybe he snores) or you don’t want to move the crate every night, transition him in baby steps. Each night, move the crate a little further away and a little closer to where you want it to end up. It’s no wonder our dogs tend to freak out and tear the place up while we’re gone. Not only are they pack animals, but their instinct tells them they need a den to be safe. That’s why providing them that cozy space when you’re away from them isn’t only ethical; you’re giving them what the crave in their nature. Yes, they may still try to break out and give you puppy eyes, but you shouldn’t feel bad about leaving your pup in a crate for short periods of time, so long as they get their exercise. We hope after reading this, you feel confident about your large dog crate purchase. Whether it’s virtually indestructible, matches your decor, or serves the purpose of bringing your dog along for an adventure, he’ll appreciate having a space to call his own.